This mortgage complaint letter asks for a loan adjustment and can also serve as a hardship letter. 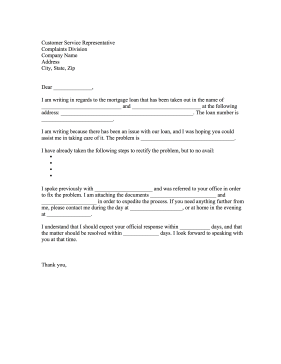 I am writing in regards to the mortgage loan that has been taken out in the name of _____________________________ and _________________________ at the following address: ________________________________________________. The loan number is __________________________. I am writing because there has been an issue with our loan, and I was hoping you could assist me in taking care of it. The problem is __________________________________. I spoke previously with _____________________ and was referred to your office in order to fix the problem. I am attaching the documents ________________________ and ____________________ in order to expedite the process. If you need anything further from me, please contact me during the day at ___________________, or at home in the evening at ________________. I understand that I should expect your official response within ___________ days, and that the matter should be resolved within _____________ days. I look forward to speaking with you at that time.